I was at a New Year’s Eve party this year and the weirdest thing happened to me. A woman I never met started asking me about my 2 year old and the baby on the way. When she heard that I was having two boys she assured me that she had two boys and she loved it, reciting all the reasons being a boy mom was great. At first I was feeling super encouraged, confident even, but not for long. The conversation turned to the struggles of toddlerhood and having two babies so close together. When I told her I was hopeful that age 3 would bring more independence and less tantrums for my toddler, she looked me square in the face and told me 3 was the worst age, in fact, according to her, 2 was a dream compared to 3. You can imagine my joy at hearing this. Now, I have no idea if 3 really is the worst age, and I’m going to venture a guess that it depends on your child and life circumstances, but the truth remains: 2 and 3 year olds can be difficult (but man are they cute). One minute they’re smiling and hugging you and telling you how much they love you and the next, they’re screaming at the top of their lungs at the public library because you told them it was time to go (after you warned them 8 times). So many emotions, so little self-control, and a whole lot of developmental milestones make this stage of life interesting, to say the least. Suffice it to say, you’ve got your hands full parenting toddlers, feeding them doesn’t need to add to the overwhelm. 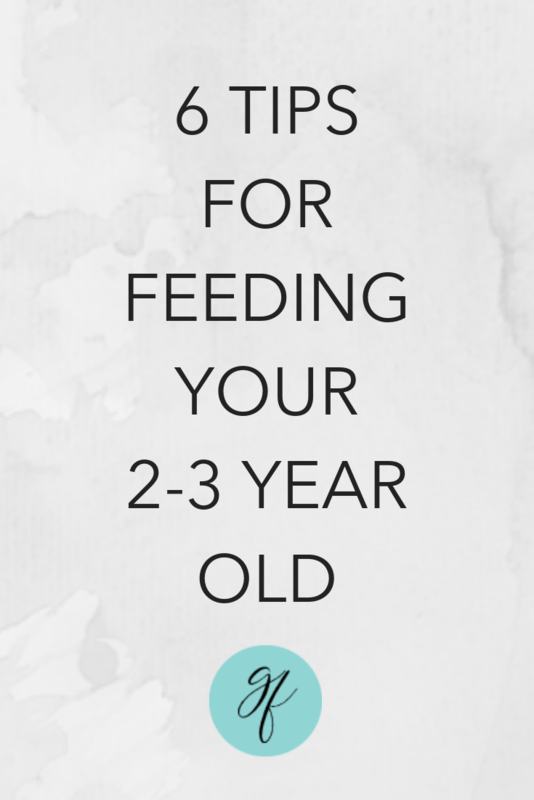 Below are 6 tips for simplifying meal time and ending the food battles with 2-3 year olds. Just like everything else with toddlers, routine is king. Little ones love to know what’s coming next, it makes them feel secure and more in control. Make a flexible routine based off of your family’s schedule. Start with when your toddler wakes up. Try to give them something to eat within 30 min to 1 hr of waking. If you have a really early riser on your hands, one way to encourage them to sleep in longer is to serve breakfast at the time you want them to wake up. Their little metabolisms are programmed to wake them up when they’re used to eating. After breakfast serve a snack or meal every 2-3 hours. If you need to, study your toddler’s habits for a few days and schedule meal and snack times around when they’re hungry. Between meals, offer water, but do not offer food or other drinks like milk or juice. A lot of 2-3 yr olds will graze all day and fill up on liquids if you let them. This can lead to food battles and frustration when come meal time, your toddler isn’t hungry for solid food. It can be difficult to deny your kiddo food in between meals. If you have a spirited toddler they may cry and put up a fight. The best strategy is to remain calm and remind them of when you will be having food next. Just like most things, give it 2-3 days of consistent effort and you’ll likely see the resistance disappear. Finally, if your kiddo is one to ask for 1000 snacks in bed, make sure to offer a filling night time snack before your bedtime routine. We love warm oatmeal and milk for this because it’s filling and supplies lasting energy for the night. Once you start thinking about these four items at meal and snack time, you’ll quickly get the hang of it. Many foods are mixed, meaning they contain 2 or more of those items (carb, fat, protein and fruit/veg). You’re probably already including most of these in your own meals. Note that even though you offer a variety of foods from a variety of food groups your kiddo may only eat one food item on their plate. That’s okay! Let them. Just store leftovers to use later and keep offering new foods with foods they have already learned to accept. Research shows that repeated exposure to new foods is required before kids will eat and accept them. Finally, make sure to include fun foods like cookies, cake, ice cream, etc. with regular meals and snacks and try not to make a big deal about them. If your child is allowed access to all foods from a young age without the messaging that certain foods are good/bad then they’ll be more likely to eat them in appropriate quantities and with confidence. Further, as hard as it is, try not to reward kids with food all of the time. Sometimes this is normal and I don’t want to go too far or recommend things I wouldn’t do myself, but switch up your rewards with non food items like toys, or tv time, or whatever makes sense for your child. Do NOT get caught up in the short-order chef lifestyle. Your toddler is capable of eating what the rest of the family is eating. If they refuse to eat it either means they aren’t hungry, or they need some time to adjust to new rules and routines. Of course this isn’t a magic response ensured to stop tantrums. The tantrum may still happen. Just remember that your child will NOT starve themselves. They will learn to adjust. I know how hard it is to remain calm and persistent, especially if I myself am already stressed out, but every time I do, I’m amazed at how quickly my toddler picks up the hint (even though 5 minutes of crying does not feel quick in the moment). Maybe you’re little one isn’t protesting food choices, but you’re concerned that they won’t be able to eat some mixed food dinners you make, you can always separate out the cooked ingredients on a plate and cut them up. When it comes to soups and stews, you might try draining the liquid off for your younger 2 year olds, but older children may appreciate a bowl of soup that looks just like mommy’s. Either way you’re only cooking one meal, which is a huge win in my book! Toddlers are control freaks. They’re like little teenagers itching for independence. Any chance we have to give them choices and more control is a chance they’ll appreciate. When it comes to meals though this can get out of hand. If toddlers are given too many choices about what to eat and when, you may find yourself with a grazer on your hand who eats very little variety. On the other hand, if they’re given no choices at all, they may be more resistant to meal times. Find an appropriate balance by offering small choices like which plate they eat off of, what cup they use or which of two fruits they want. The key here is to offer choices where you’ll feel comfortable no matter which option your child chooses. Try not to get in the habit of asking, “what do you want for dinner” with this age group. It may lead to them eating things your aren’t happy with or putting up a fight when you offer something new. Again, YOU are in charge of what is offered and when it’s offered. They are in charge of what they choose to eat (from what’s offered) and how much they eat (or whether they eat at all). If you want to allow them more freedom with choosing what they put on their plate from what’s offered, you can try family style meals. In other words, bring all your sides and the main dish to the table and help them choose and serve themselves from what you’ve cooked. Since none of us live in a vacuum, it’s worth pointing out that all of these tips have room for flexibility. Things like traveling, day care and missing snack/nap time happen. Be flexible with your routine. Your child does not need to eat at the same exact time each day, but instead should be offered food about every 2-3 hours. Similarly, if your day care has a different schedule than you, try to align your weekend schedule to their day care schedule (as much as possible) and if need be, have a conversation with your child’s caretaker about your feeding goals. Finally, don’t put so much pressure on yourself to cook perfect home-made meals made from 100% whole foods. Your kiddo’s body is able to handle and process foods better than you’d imagine. Keeping packaged snacks on hand for car-rides and errands out is not wrong, a lot of times it’s necessary! Give yourself some grace and do what works for you. Fed is best definitely still applies for your older kids. I know I’ve already talked about this throughout, but it serves to mention it again. This age group tends to test the waters. Lots of testing can lead to a stressed out mama (trust me, I know), but the more we remain calm, the more they realize the boundaries. Reacting emotionally only serves to make them feel insecure and resistant to meal times. Toddlers have strong emotions and often that means loud crying fits or repetitive complaining. When it comes to meal time battles, decide what your boundaries are (eating at certain times, eating what’s offered, sitting at the table to eat, etc) and be prepared to hold firm to them. This does NOT mean yelling, punishing, etc around meal time, it just means being okay with their dislike and likely skipping a meal or two. They are learning so much at this age including food behavior. Your toddler is not a “bad kid”, a “disobedient child”, or a “bad eater” because they test the boundaries with food and push your buttons — that makes them normal. We can’t control their reactions, but we can control ours. Until next time, happy fueling and stay nourished, body, soul & spirit.